Next Saturday, members of the North Bethesda Distance Project (well, actually just Jordan and I) will be participating in the annual Rock Creek Cleanup. I've signed up to meet at the link below at 9:00am, because I frequent this part of the trail most mornings. If any other GRCers wish to "give back" to the creek we love so much and join, please let me know so that I can update the site leader as to how many will come. Since Cherry Blossom is the next day, I'll likely shuffle an easy 30 minutes beforehand. Furthermore, if any GRCers want to work on a section closer to their respective home, feel free to sign up via the link below. There was some talk of getting a chain gang going down at The Line. Susan Hendrick and Meghan Locket went 1 and 2 in the 3,000m run at the Maryland Invitational. Dave Wertz was just shy of his personal best in the 5,000m with a time of 15:33. JR accomplished his goal of 15:55. Sebi seems to have had an off day. Witty opened up his outdoor season with the equivalent of a 4:16 mile. If anyone is interested, Dickson and I are running (at least) 14 miles tomorrow at Edward's Ferry at 9:00am. Comment if you want to join. The GRC women highlighted a list of stellar GRC performances on Friday at the Raleigh Relays at NC State. Hilary May shattered the GRC record in the 5,000m late on Friday night with a time of 16:56.27. Hillary raced hard in the lead pack for 2 miles, coming through 3200 in 10:40, close to her PR. By 4k she was spent, but fought through a rough patch and finished hard the last 200 to insure she broke 17. 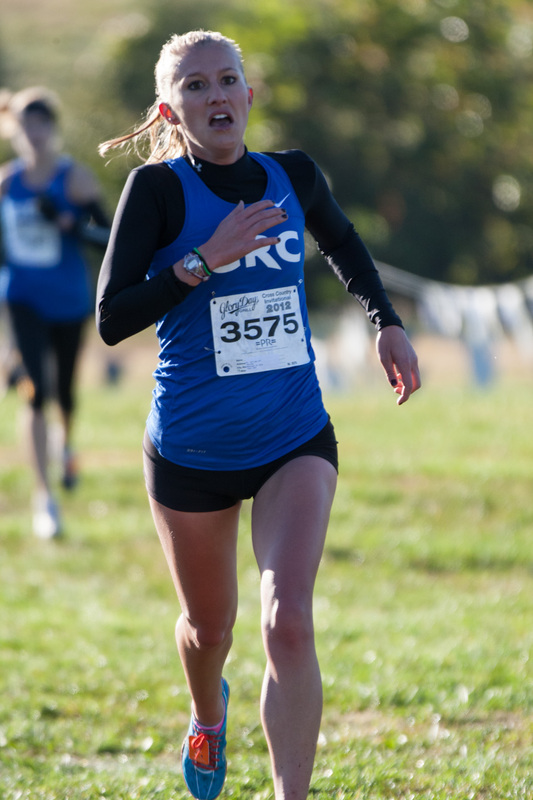 Teammate Catherine Campbell finished 12-seconds back with a personal best of 17:08. Catherine's time also broke the old GRC record of 17:27 set by Maura Carroll at the Swarthmore Last Chance Meet last year. Coach Jerry Alexander observed "The women ran spectaculary, with 3 very impressive PRs. Hilary ran one of the best races ever by a woman in a GRC singlet, and she is only going to get better. Catherine will join her in the sub-17 club this spring, and Beth is going to add to her string of PRs when she returns to the roads at Cherry Blossom." On the men's side, Sam Luff opened his track season with a 14:43 while Joe Wiegner ran an eye-opening sub-15 minute effort in his second race of the year. "Wiggy got out aggressively and hung on to accomplish his goal of sub 15. It was an impressive performance for a guy who hasn't races on the track in 2 years. Fridge ran an excellent tactical race and proved he belongs on this level" noted Coach Jerry. Earlier in the day, Matt Hassett and Beth Young both ran personal bests of 15:25 and 17:41, respectively. Hilary May - 16:56 NEW GRC RECORD! Beth Young - 17:41 PR! Matt Hassett - 15:25 PR! In other races, Charlie Ban ran 15:41 at the Fred Hardy Invitational in Richmond, and the GRC will have a contingent racing at UMD on Saturday. The Georgetown Running Club is sending harriers to both North Carolina State and the University of Maryland to compete in an assortment of track races on Friday and Saturday. Six athletes - three men and three women - will be racing the 5,000m run in Raleigh on Friday. On Saturday, an additional six runners will race distances ranging from 1,500m to 5,000m in nearby College Park, Maryland. First up on the track will be Matt Hassett, affectionately known as "Fridge", who returns to racing after a rust-busting performance at the Kelly Shamrock 5k in Baltimore earlier this month. Fridge has been looking sharp in workouts and has the potential to threaten his personal best of 15:33 when he takes to the oval on Friday morning. "This is a huge step up in competition level for Matt", said GRC Coach Jerry Alexander, "and he is ready for the challenge of running in a super-competitive environment." 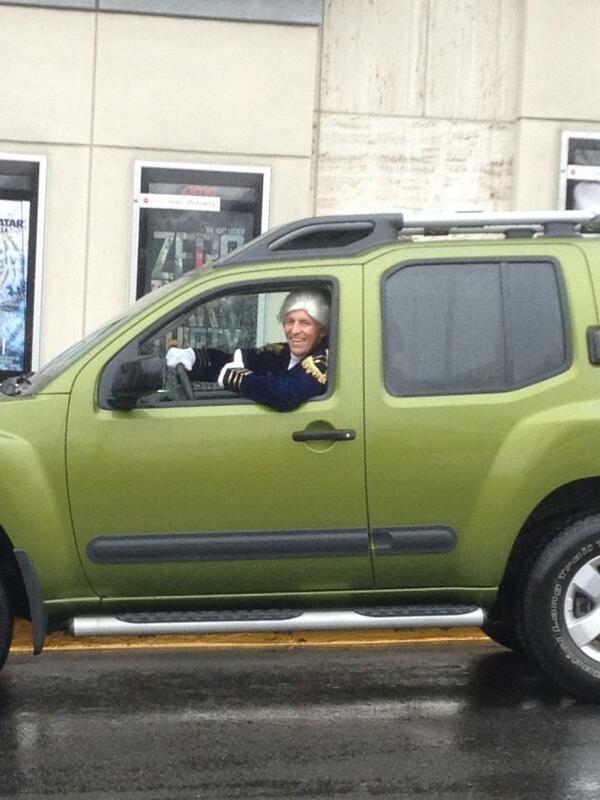 Beth Young, the field hockey standout turned runner, will also race 3.1 miles on Friday morning. Young had been scheduled to run the RnR Phoenix Marathon in January, but was sidelined by an injury and the flu. She now has her sights set on the Eugene Marathon in May, but hopes to run a few personal bests in the shorter distances along the way. "Beth is running only the second track meet of her life, and while her training has been focused on marathon preparation, she is ready to give the middle distance crowd a run for their money." 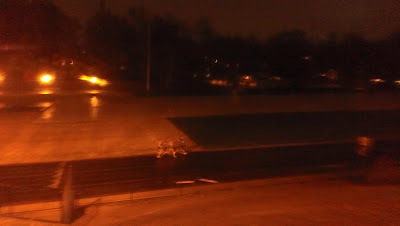 Late on Friday night, under the bright white lights of the Dail Track & Field Complex, GRC's 2011 and 2012 Runner of the Year, Sam Luff, will start his outdoor track season after running 24:48 for 8k in Washington, D.C earlier this month. Luff owns club records in both the 5,000m (14:15) and 10,000m (29:37). 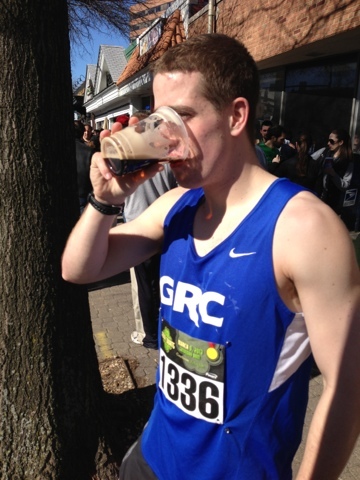 Lacing up alongside Luff will be Joe Wiegner, the 2013 Kelly Shamrock 5k champion (15:15). Wiggy has not raced a track 5,000m in almost two years and his return to racing will be eyed with continued curiosity. Teammates Hilary May and Catherine Campbell, who have been working out together in recent weeks, will benefit from racing in the same heat on Friday night. May, a former Harvard track star who boasts a time of 2:08 for 800m and Campbell, a distance runner with speed, will hopefully work with one another during the twelve and half lap race. After a particularly fast repetition at a recent Wednesday night workout, Campbell, between breaths, declared "I haven't run that fast since I was 14." "I'm normally not one to make predictions, but I'm confident that the women's 5k club record will fall this weekend in Raleigh", boasted Coach Alexander. "In fact, I would not be surprised if all 3 of our entrants run faster than the current record. Hilary is extremely sharp, having run a huge 3k PR and club record indoors. Catherine has looked fantastic in workouts, and will take a shot at a PR in her first race on the track this season." Closer to home, Ryan Witters will race the metric mile in his first outdoor race of the season. The club record holder in the 1500m, Witty, as Coach Alexander notes, "is looking to start outdoors with a bang, before moving up to the 5k later in the season." GRC newcomer Sebi Devin-Foltz will lead a trio of harriers in 5,000m action. Sebi's GRC track debut comes on the heels on an 8k road personal best recorded earlier this month. "If Sebi can stay healthy, he's going to be a great addition for us", noted Coach Alexander. The ageless Dave Wertz, who turns 53 this year, will be running his third track 5k of his life. "He's PR'ed in first two attempts", said Coach Alexander, "and I have every confidence that he'll continue that streak on Saturday." The third, and final, member of the 5k squad is JR Roberts, who is hoping to run sub-16:00 effort. Said Coach Alexander, "JR is still working off the rust from his extended post-collegiate break, and he's starting to round into shape. When JR first came on board I said he was an A team talent with D team fitness, but he's worked his fitness up to C team level, and he's looking to step it up to B team level this spring." On Wednesday night, members of the men's team were striding out the last 100m of their 6th (of 8) 800m repeat. While the boys were fighting it out in lanes one and two, a tall blonde, in lane four, came bounding down the backstretch and passed the men as if they were standing still. She split 64-seconds for the 400m. Susan Hendrick is ready to race and has the potential to add a GRC club record in the 3,000m to her already impressive resume when she competes in that event on Saturday. Home-schooled sensation, Meghan Lockett will also be racing the 3,000m. "Meghan is coming off an excellent indoor season where she developed new-found strength, and that strength is going to pay major dividends this spring." After a 15-month buildup following the 2011 Club Cross Country meet, Jimmy Daly is back on the race course. His goal at the Scope it Out 5k was to work hard for the last mile, and he did just that. The Montgomery County Road Runners Club voted our own Sam Luff as their 2012 Male Runner of the Year (ROY). Luff accepted this coveted honor this morning in Gaithersburg, Maryland at the "Piece of Cake 10k". Anyone interested in the Zoo Loop at 9am? I'm open for other options if anything else has been discussed? There’s no question about it: this team likes to eat. I’ve seen teammates savage snackbars and punish pizzerias. There have been Boeymonger binges and BBQ benders. And who could forget the pies at the By George! 10k, the “cornbread Sunday” at Grandma’s Half Marathon, the "Pig N'Steak," or the time that Karl took down a 5-pack of peeps in 47 seconds? These accomplishments deserve the respect of all readers, but perhaps the single greatest feat of gluttony in club history– measured, of course, by calories per second – occurred nearly one year ago after the 20th Annual Van Metre Five Mile Run. A string of overall and age group placements yielded hundreds of dollars in Glory Days Bar & Grill Gift Certificates, which fueled some of the most intense feasting ever witnessed in Fairfax County (thereby putting the episode in the running for statewide consideration, as Fairfax County is home to some of Virginia’s most illustrious eaters). 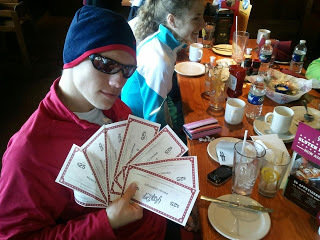 Runners redeemed the certificates – displayed below by Charlie “Thug Life” Ban shortly before “making it rain” with Glory Days currency – for every item on the menu. There were wings, dips, tacos, milkshakes, ice creams, and hamburgers. And it was glorious. In addition to an enviable haul of Glory Days Certificates, Van Metre offers a fair course and tight organization. The gun goes off at 8:30 a.m. on Saturday with proceeds going to benefit the Children’s National Medical Center. GRC has a rich tradition at this race with past champions including Beth Young (2011) and Dirk De Heer (2010), and runners up including Karl Dusen (2011) (club record) and Laura O’Hara (2008). There will be a big crew out there on Saturday, including Charlie, Karl, Viking, Pauly B, DaveO, Stefan, Outlaw, Klim, LTO, Maura, LDO, and Elyse. Many of these runners have their sights set on Cherry Blossom and are using this race to tune up. Race and consumption results to follow. It was another great weekend for GRC! With so many stellar performances, it's hard to pick a headline, but we certainly can't go wrong starting with Sean's race at the World Military Cross Country Championships in Serbia. Sean was 40th overall, and 3rd American, in the long course race, which was just over 11k, and the US team finished 6th. Sean reports that the course was "an absolute mess" due to rain and snow prior to the race, and the sloppy going slowed the times but suited him well, and he was pleased with his performance. It's not every day that one of our athletes has the honor of running for the United States in international competition, and Sean represented his club and country with distinction. Well done, young man! Closer to home, we had absolutely stellar runs in the Rock and Roll USA Half Marathon from Teal and Julie. Teal ran a huge PR of 1:21:57, and Julie crushed her prior PR by running 1:22:04. I can't overstate how happy I am with both of those performances. Kerry, the third member of our esteemed Boston group, ran a very controlled 1:23:47, and the three of them are going to do some serious damage on April 15. The fine performances in the half did not stop there. Beth ran a super relaxed 1:24:06, and she is setting herself up for a huge spring, which will culminate with her inevitable gigantic PR in the Eugene Marathon in late April. Our men prepping for Boston ran well, led by Stefan with a comfortable 1:13:15. Ken ran a nice PR of 1:14:36, and Lavar ran a solid 1:17:04. The performance of the day among the men was from Murph, who ran an excellent 1:14:18 off of limited training. Finally, Hilary got a jump on the outdoor track season with a 5k PR of 17:39 at the Occidental Distance Carnival. Now that she's got her first outdoor 5k under her belt, Hilary will run much, much faster later in the season. 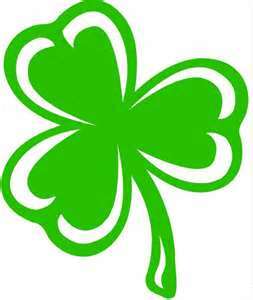 For those who are not racing this weekend, we will have practice on Saturday at BCC at 4:30. The late start is necessitated by track conflicts for most of the day. If you are running Van Meter, register TODAY because the price goes up tomorrow. Please be sure to list your race schedule on the GRC spreadsheet. This is especially important for track meets. Once I hit the send button on the entries for a particular meet, it can be very difficult, if not impossible, to make changes, and if I don't know you want to run, you will be out of luck. We'll be at BCC on Wednesday for our normal 7:15 start. The men will do 3 x 1200, 4 x 600, 4 x 300. 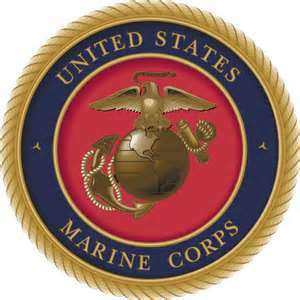 This weekend, Marine Corps Captain Sean Barrett will represent the United States at the World Military Cross Country Championships in Serbia. Barrett, the second GRC athlete to don a U.S singlet -- ex-pat Caroline White competed in the same competition in Ivory Coast in 2009 -- qualified for the United States all military team by finishing among the top seven military entrants in the USATF Cross Country Nationals in February. "Racing with USA across your chest is the greatest honor a runner can have, and Sean has earned the right to represent the country on Saturday," said Coach Jerry Alexander. "He is in superb shape, and the forecast of sloppy going favors Sean, who may not be the most talented guy in the world-class field, but he's certainly among the toughest, and he is going to give it everything he's got, no matter how bad the conditions." In other out of town action, Hilary May will be making her outdoor 5k seasonable debut at the Occidental Distance Carnival in California. "Hilary ran a spectacular 3k indoors in New York two weeks ago, and she is ready to keep that momentum going outdoors with a strong opening effort," said Alexander. The PR train kept rollin' for May, who finished in 17:39. 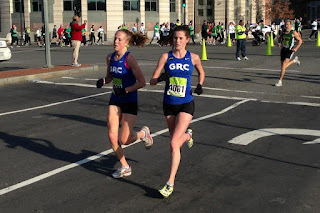 Back in the District, GRC will be out in force at the Rock and Roll USA Marathon and Half Marathon, with Boston-bound runners looking to have a big day. "I'm looking for strong performances from our women, particularly Teal Connor and Julie Tarallo, both of whom will be looking to PR. 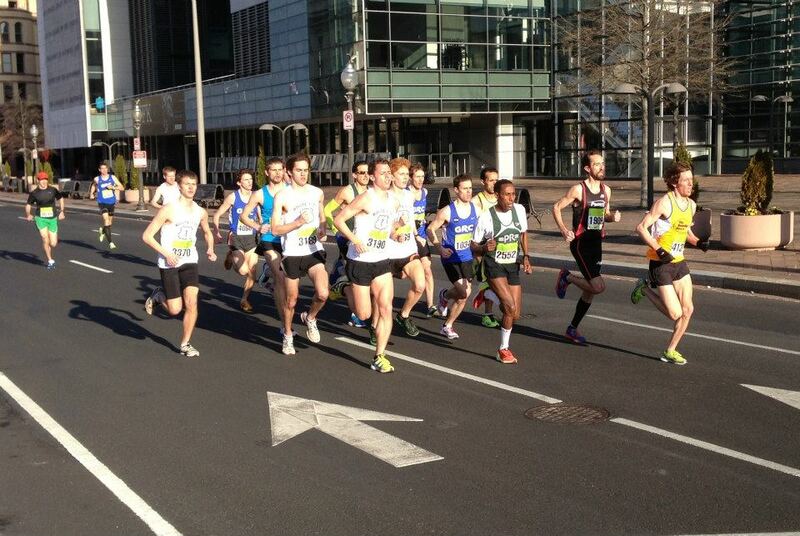 They're in great shape, and this race will help them build their confidence for Boston." Boston entrants Stefan, Kenny R. and Lavar are geared up for a key tuneup. In last year's race, held on March 17, Patrick Murphy, inspired by the spirit of his patron saint, hit a huge PR (1:13:29) and continued the heroics during a post-race celebration that rivaled his athletic achievement in terms of focus and determination. Murphy's PR last year was a major breakthrough at that distance and he is looking to turn in another excellent performance tomorrow. Look for Kerry, Beth Y, and Scotty Koonce on the course too. Dangerous Dave Wertz and JR will be hitting the roads for a local 5k. Tarallo- 1:22:04- EIGHT MINUTE PR! 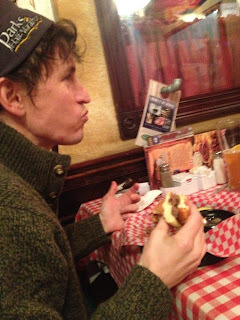 Scott Koonce’s preparation for the Rock and Roll USA Marathon has been, in his words, "a little rough." This time around, work and family commitments – most involving snow sports – have made training difficult for Koonce, a father of three who manages investment portfolios at his own firm in Gaithersburg, Maryland. Although he’s been logging 60 mpw and hitting the track when possible, Koonce’s long runs this cycle have been few and far between, and none have topped 18 miles. Although Koonce’s barn could accommodate more hay, it’s bursting with good karma. 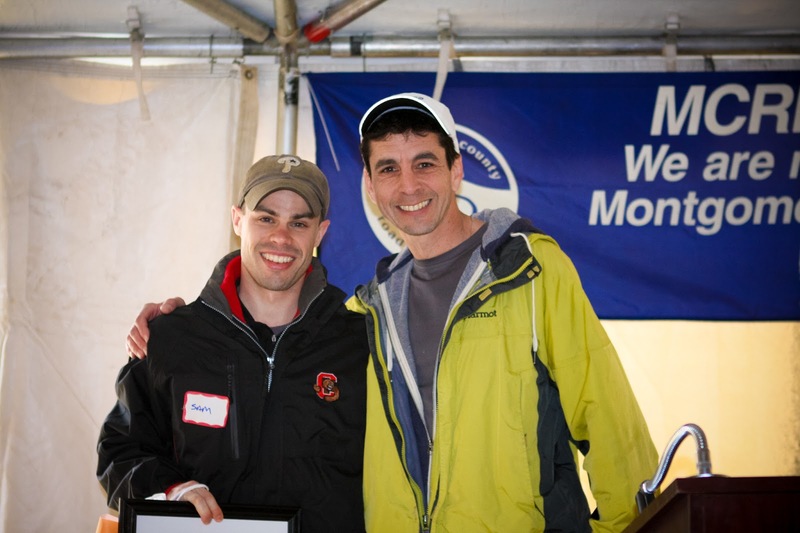 Scott’s road to the RNR USA Marathon began in October at the Woodrow Wilson Bridge Half Marathon – host to the NIB Visually Impaired Half Marathon Championships – where he served as a guide for a V.I. athlete. 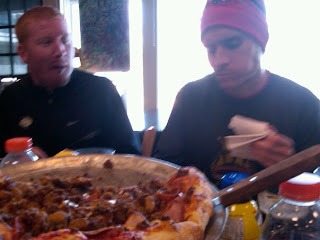 Things went well and the pair agreed to team up again for the Chevron Houston Marathon in January. But a last second illness forced the runner to withdraw and threw into chaos the guide’s winter racing schedule. Koonce (seen here dressed as a Founding Father) is attempting to make the best of a tough situation by rolling the dice on a late entry in the RNR Full, set for March 16. While a PR under these circumstances is not realistic, Koonce intends to attempt a negative split and stay competitive in the masters division. Can karma sustain a runner after his glycogen stores hit empty? Scott Koonce is about to find out. Congratulations to everyone who raced this weekend. It was one of those rare but highly-enjoyable occassions where a large number of our athletes competed, and the results were positive across the board. Let's do this again real soon! The successful GRC debuts of Paul Balmer and Sebi Devlin-Foltz. Paul and Sebi are were friendly rivals throughout their college careers (at Pomona and Occidental, respectively) and they both come to GRC with a large resevoir of untapped potential. After solid PRs yesterday at 8k, they are on their way to proving that they will be key assets to the team in 2013 and beyond. 8k PRs from LTO and Teal. 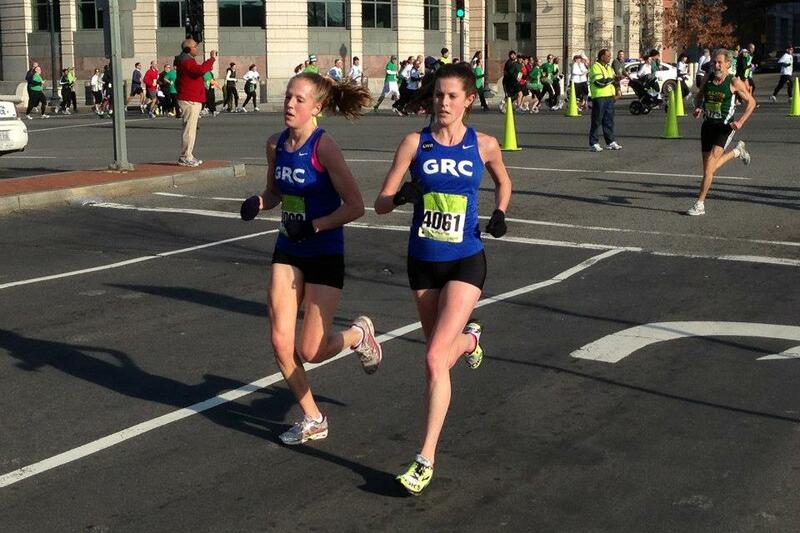 LTO is back in form, and is taking aim this spring at her long-standing 10 mile PR. Teal is in the process of sharpening up for Boston, and her new-found 8k speed will pay dividends at the longer distances. A solid PR from Meghan at 2 miles at the New Balance Indoor Nationals. Meghan is setting herself up for a huge outdoor season. Wiggy's return to high-level competition. Wiggy is a man on a mission this spring, and he got his season off to a great start by demolishing the field in the Shamrock 5k in Baltimore. A strong performance at 8k from the ageless Dave O. Dave kicked like a man possessed, and he is going to build on the 10k PR he ran in the fall. Controlled, consistent performances from Lindsay, Catherine, Susan, and Sam at 8k. We're going to see big things from all four of them this spring. Now that warmer weather and daylight savings have arrived, there will be many, many more people using the track on Wednesday nights. The other training groups and folks from the neighborhood have as much right to be on the track as we do, so let's be sure to be courteous, and not bring any negative attention to ourselves. If you haven't already done so, please enter your races on our team calendar. This is particularly important for those of you running track meets, as I can't enter you if I don't know you're planning to run. We will have practice on Saturday in the mid-to-late morning at BCC. I'll send more details later in the week. We'll be at BCC on Wednesday for our normal 7:15 start. Meet for the warmup at 6:30. The men will do 4 x mile with a 2:30 recovery at maintenance pace. I'll send the women's workout separately. 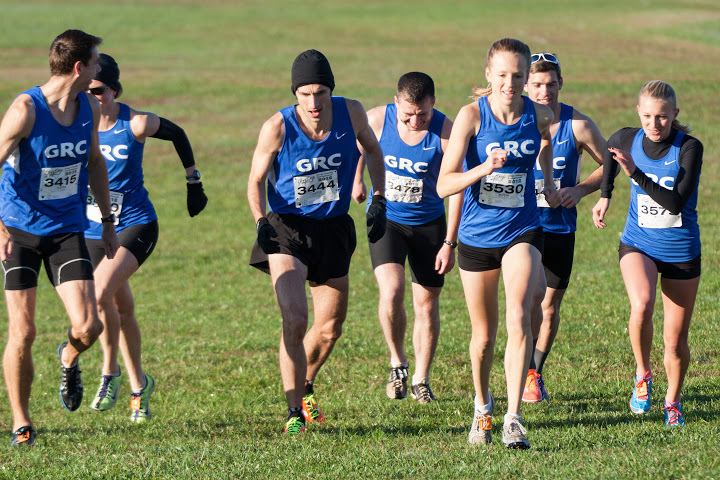 Thirteen GRC runners will tow the line tomorrow to contest the women’s and men’s team competitions at the St. Patrick’s Day 8k. 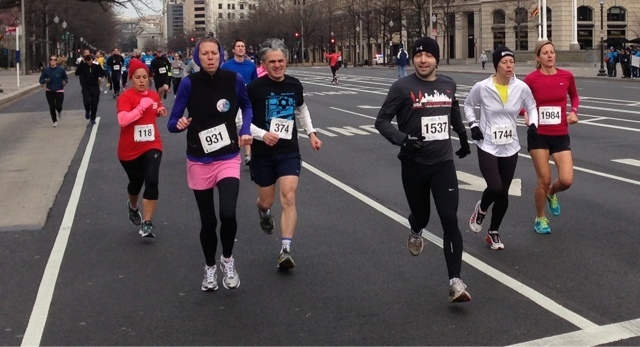 The race starts from Freedom Plaza at 9 a.m. tomorrow and finishes along Pennsylvania. You can find a course map here. LDO, LTO, Catherine, Susan, Teal, and Avril are competing for the women’s team. Luff, Outlaw, DaveO, Lavar, and Breezy are heading down to the National Mall to begin in earnest the spring road racing season, in addition to GRC debutantes Sebi and Paul B. The team wishes to thank Pacers Events for putting on what promises to be a terrific race. 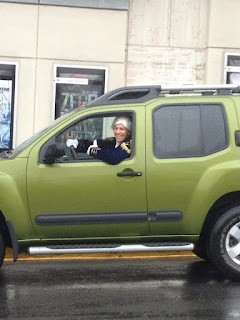 Further up the BW Parkway, Joe Wiegner won St. Patrick's Day gold at the KELLY Shamrock 5k with a time of 15:14. Fridge reportedly ran 15:40 for 4th and Karl 15:48 for 6th. 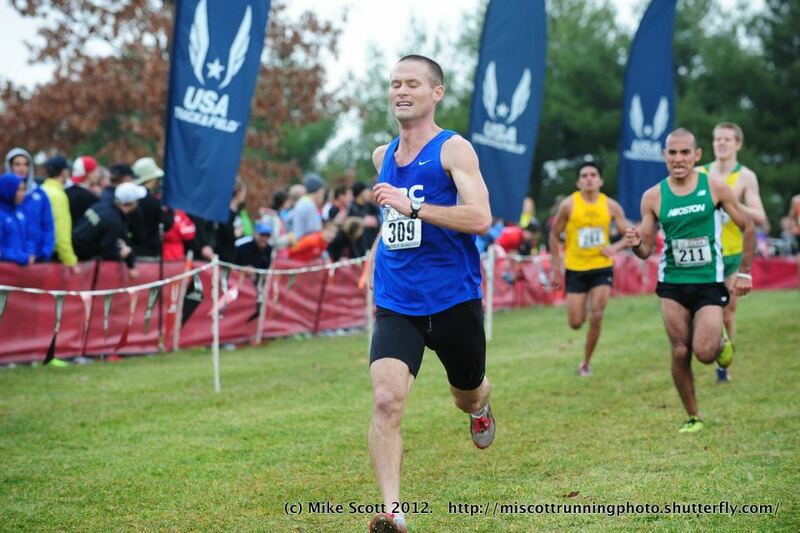 Saturday morning in Arlington, Kenny Rayner ran 22:16 for third place at the Four Courts Four Miler. Good for 3rd among emerging elites at the New Balance National Indoor Championships. Any one interested in running from the Georgetown Store tomorrow morning? And more importantly, eating Mimi's afterward? I'll just be looking for an easy hour or so. On her birthday no less, Hilary May ran a huge PR of 9:52, moving up in the latter half of the 3k field at the Columbia Last Chance Meet.